Seminoles makes his debut at Cranbourne on Wednesday where he is one of our three runners. Seminoles is in race one, the Maiden Plate over 1400m with James Winks to ride from barrier three. Mike Moroney would have preferred a race against his own age foe the three-year-old son of Reliable Man but there were no suitable options. 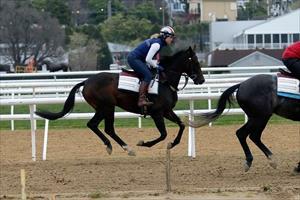 “He’s had some practice at home and he’s ready to go to the races,” Moroney said. “He’s shaping as though he will need a little bit of ground so a 1000m race would not help him so he’s in the Open Maiden. Meteor Light and Potemkin are our other two runners, Meteor Light in race five, the Benchmark 70 Handicap over 2060m and Potemkin in race six, the Benchmark 70 Handicap over 1600m. Meteor Light (pictured) finished sixth over 1800m at Sandown at his last start on August 29 and will jump from barrier seven in a field of 11 with Patrick Moloney to ride. “It’s a bit of a tricky draw but otherwise it looks a nice race for him,” Moroney said. “He was a bit disappointing last start but it’s his first preparation here so he might still be acclimatising to it all. Potemkin is deep into the campaign and jumps from barrier six with Patrick Moloney to ride. “Except for his last start he’s been racing well,” Moroney said. “It would be helpful if we got some rain to ease the track, last start he struck a heavy track at Wrrnambool and that didn’t suit him.